This collection of short stories does not fit in any box. With protagonists that range from a teenage assassin to a runaway elephant searching for its young keeper and even a young boy singing his sister down as she sinks beneath the tar, every story has its own distinguishable hook. I’m not saying that I liked every story but I couldn’t put them down. Some tales are gentle journeys of longing, others tear my heart open, and still others leave me wondering what on earth just happened. There is violence, internal conflict, jealousy, anger, hope, fear and, of course, love. Take your pick. Pick up any story at random, but be warned: you really won’t know where a story in Black Juice is going until the last lines. Margo Lanagan creates new words to fit perfectly into her totally believable, imaginary worlds. She speaks from the heart and mind of her characters and she weaves gentle word webs so strong you won’t be able to escape until a story is done. 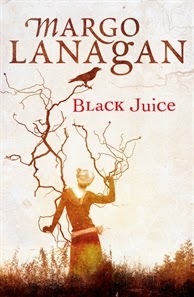 Black Juice has won or been shortlisted in no less than fifteen major local and international awards. It is extraordinary.